LOS GATOS, Calif.--(BUSINESS WIRE)--Roku, Inc. (Nasdaq: ROKU) today announced the company is offering streamers incredible Black Friday deals including $50 off of the popular Roku Ultra, $20 off the portable Roku Streaming Stick and a new limited-edition Roku SE streaming player available exclusively in-store at Walmart for $20. The Roku Ultra will be $50 off the usual $99.99 MSRP at major retailers nationally from November 22 through Cyber Monday, November 26. The Roku Ultra is Roku’s most powerful and feature-packed player great for heavy streamers, living rooms and primary TVs, or even home theaters. It features a clear and immersive picture for HD, 4K and HDR content, an enhanced voice remote with TV power and volume buttons and a headphone jack for private listening, premium JBL headphones (valued at $39.95 MSRP), a USB port for local playback and much more. Beginning November 18, the portable and powerful Roku Streaming Stick will be $20 off MSRP at major retailers through November 26. The Roku Streaming Stick is a High-Definition player great for wall-mounted TVs, reducing clutter and hotel and dorm use. It features a voice remote with TV power and volume buttons. The all-new Roku SE offers an incredible value at just $20 including access to 500,000+ movies and TV episodes across thousands of free or paid channels, a simple home screen, fast and easy search - all in a compact modern white form factor. The Roku SE is only available in-store at Walmart on Black Friday, November 23, while supplies last. Content offers valued at $45.99 round out holiday savings with deals from Sling TV and SHOWTIME®. Customers who purchase and activate a new Roku® streaming player or Roku TV™ model between now and January 13, 2019 are eligible to receive, for FREE, a $35 credit towards a Sling TV subscription (new Sling TV customers only) and a 30-day free trial of SHOWTIME. 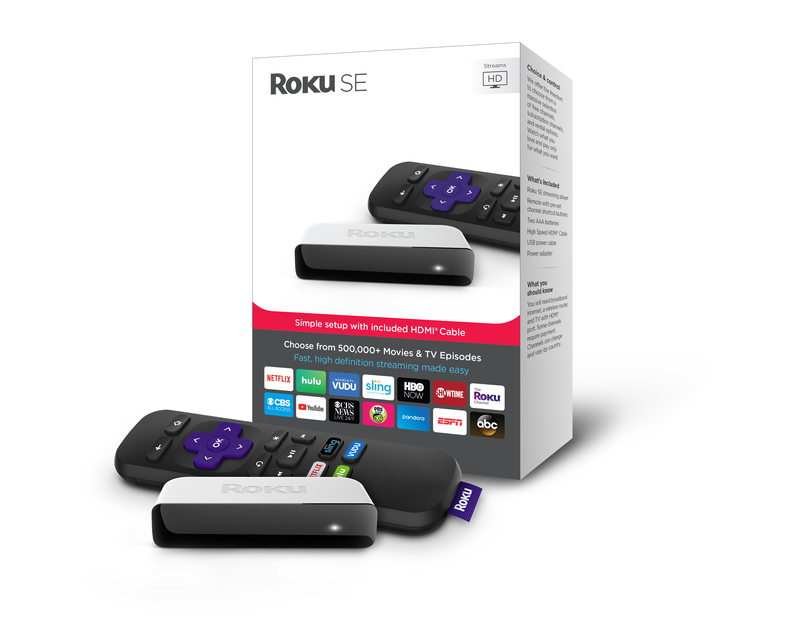 For a list of all content offers including complete details, eligibility, and terms and conditions visit: www.roku.com/offers. Comprehensive and Unbiased Search: Search across 1,000+ streaming channels for actors, directors and titles and see results from all available options in order of price beginning with free. The Roku Channel: A collection of free movies and TV episodes plus news; there are no fees, logins, or subscriptions required. Now available via desktops, laptops, mobile phones and tablets on therokuchannel.com. Featured Free: A new navigation item on the Roku home screen that pulls forward the crown jewels of in-season and syndicated classics from network channels across the platform. Mobile Companion: Control your Roku device with the Roku mobile app for iOS® and Android™ devices as well as enjoy private listening and voice search features. Google Assistant: Control select Roku streaming devices to pause and search for content and launch channels. Additionally, Roku TV owners can turn their TV on and off, turn up the volume, mute, switch inputs and change channels if there is an OTA antenna connected. Roku TV partners are also offering a variety of great deals on Roku TVs that can be found at Best Buy, Walmart and Target.